Requested by loads of people. I originally thought this would be a job for PCB, but after several more requests I had a think about it and estimated this may just about fit is a 1590B if I was careful. It turns out it will fit more comfortably than I expected. It will probably still need to be mounted with components facing down, especially with the dual log pot, but it'll still be fairly comfortable IMO. You guys totally rock. This one should be fun. Hey, any chance you could do a tutorial on this, explaining how to mod the curcuit. Kind of like how a Keely or Allums might. So us noobs can experiment with some knowledge. Thanks for all your work. Where's Geiri's build & demo? Is he sleeping? Good God! Maybe I should start scanning the classifieds after all! Your ambitions are admirable. Bravo. Sounds awesome even without the Keeley mods. I have built about 40 distortion pedals of all sorts over the last 3 years. None of them sounds like the BD-2. It's a wonderful sounding pedal which compliments other pedals driving it. The combinations of the BD-2 with screamer/rat/FF/TB all deliver fantastic Rock tones. Awesome! Definitely on my build list! Seriously, I would love to see an HM-2 layout. Make it happen! This is not all-inclusive in what can be done to the Blues Driver. It is meant to give an idea of where the tone can be improved or changed. All of the changes are subtle but when packaged together offer a nice improvement. D3 Change this 1SS133 to a different (1N4002) diode for asymmetrical clipping. This adds second order harmonics. This adds to the tube type sound. I like the sound of this change. D7 D8 D9 and D10 Change 2 of of these diodes from 1SS133 to a single 1N4002. More second order harmonic distortion. Although the change is slight, I like it. We actually take out one of the two pairs and replace it with a single 1N4001. C1, C7, C6, C12, C13, and C15 Change this electrolytic capacitor to a 10uF Non-polarized caps. Non-polarized caps sound better . I like these anywhere there is signal coupling at this high a value. C14 Increase input coupling capacitor value to 0.1uF for increased bass response from your guitar. C100 Here is where we can affect the tone control. I prefer a little more lower-midrange and bass frequencies through the tone section. You can increase the lower frequencies by increasing the capacitor value to 0.033uF. Install a switch to add a 0.068uF cap in parallel with this value for the Phat Mode! Most of the ceramic caps are changed to Expensive Silver Mica (available through Small Bear Electronics http://www.smallbearelec.com or http://www.mouser.com or http://www.digiley.com). This is what makes our mod sound so good. A noticeable reduction in noise. An increase in the smoothness and no harshness left. This type of upgrade is not found in anyone's mods. The best sound is right here." also refer to the wampler diy books (availabe on fsb)for various mods well described and simplified even for non-technical hobbyists. The mods are what makes this and ds-1 so special. C100? WHere is C100 on this? Hey all thanks for the great information. Is this true bypass or can I use a spst switch to turn on off? I know the bd2 is not a true bypass pedal. True bypass. All the buffer switching components have been removed. oh okay, doesn't removing those components change some of the sound characteristics of the pedal though? Yes. The bypassed signal won't eat up your highs no more. Effect on characteristics? No. It removes the input and output buffer. It may change the characteristics slightly but whether that's an improvement or detrimental we will know when someone who has an original builds one. One thing is for sure, I would never include the Boss switching in any of my layouts, it would make the layouts twice as big (or more in some cases) and if I wanted something dead on I'd buy a BD2. One of the reasons for doing layouts for the cheaper pedals is to use true bypass instead of the stock switching and remove two extraneous buffers from the signal path. I'm definitely a fan of buffers but prefer to choose myself when and where to add them to the path. Could you recommend your favorite buffer design and your preference on where to put it? Verified!!! I can't tell you how glad I was that this fired up, I was convinced that it wasn't going to work and be a nightmare debug. Fortunately there was none of that and it sounds pretty damn close to the demo, although there's not quite as much gain, I only had a 220k dual gang, would using a 250k make the difference? I think the extra 30k could make some difference. I had a BD-2 that I modified and I always felt that it had too much gain at the very end of the gain pot. I was beginning to wonder what happened to you as you were pretty quiet for a while. Seems like you're back on the saddle! Another one down! Thanks man! Didn't see Geiri's comment.. :) I think the pot value being off 30K could make slight difference, but pots have tolerances too... So that's why i'm convinced that it will work just fine. Maybe a little off from the original on the control.. I've finished the secondment I've been on so I'm back at my old job, which unfortunately means shift work, so I've not had as much time to build. I had a day off today though so I thought I better spend it wisely. You and Mark seem to be motoring on with the layouts, I think there were 56 unverified at the start of the day! Thanks for the info Geiri, I think for the extra £1 I'll find a 250k dual gang, stick it in and see if it makes the difference. I'm definitely going to have a go at the blue box, the octave only synth type sound is awesome. Oh and roll on 500 Mark, that really is a crazy number of layouts you two have done. If you want to test it before you get the 250K pot, add the 30K in value on to the 22K resistor attached to Gain A 1, and the 33K resistor attached to Gain B 1, so swapping for 56K and 62K resistors should do the trick. Thanks Mark, I'll give that a go. Miro - SPEECH SPEECH SPEECH SPEECH! with your favourite alternative at the other side from D1 to D4. Or maybe just remove D1 and D2 on the right hand side, put those on one side of the switch and a single 1N4001 in the same orientation on the other. That would make is stock in one position, and Keeley mod in the other. I did think about trying this when doing the build but thought I best try it stock first, there's definitely scope for improvement with the sound, great at low gain but a little fizzy when cranked. Although I did just change my strings for 9s so that could have something to do with it. Really a great sounding pedal. I have this same issue, I realize this post is ancient, but it's worth a shot. Did you ever fix this? same for me. circuit seem correct but there is hiss noise with gain pot manipulation. did you fix this ? and another question : what is the function of the zener in this circuit ? Could anyone advice how to remove the input\output buffers and switching on the Boss OD3? I see he removed the tone control but there are a lot more parts missing, any idea what's going on there? He's taken out the opamp filtering section completely so I'd say that probably shouldn't be called an OD3 at all, it's just based on the OD3 gain stages. Mine removes the input buffer and buffered bypass components. Hi Mark, thanks for this one and actually for al your work with these projects. I finished it yesterday, and the sound is awesome (even if it has considerably less gain than the original). But... I have the same issue as reported by tomo6314 above: there is a constant sqealing noise. When I touch the lugs 2&3 (connected together) on the gain pot this noise disappears. Do you have an idea what this could be? I routinely go through the strips with an xacto knife, so I don't think it is a short between the strips. Didn't check for cold solder joints yet though. Anything else I could possibly look for? Thanks! built this one yesterday. I did the Keeley mods to mine plus a couple of Brain Wampler's mods too. I also gave it more low end for use with a bass. I didn't have a 250K dual log so I used a 250 dual lin and its taper is fine (and might preferable) for the gain control. Also another question: how would I lower the voltage to 8V? Would a polarity protection series diode help (or actually rather two for that matter)? Or should I opt for a voltage divider made of resistors? Thanks! you could just use a 10K trim pot and adjust it to 8V. I just used a 180 ohm resistor on mine. Did the mods, here are my findings: my two cents are for the TL071 and the J201's. I only could get BF245B's, those resulted considerably lower gain. Also lowering the voltage to 8V lowered the gain too much for my taste. So I ended up using 9V, TL071 and the J201's. With this I had to lower the original 15k resistor to 8.5k to avoid oscillation. Unfortunately quite some highs got lost too with this, but the last 1/4 of the tone pot's range is still usable. The OP07 would not be bad, but with losing the highs the bass gets too spongy for my taste with that. The circuit is still pretty much usable, but far less versatile than the original BD2. Since the BD2 is not an overly expensive pedal I might end up buying one (again) instead of this circuit. And of course thanks a lot for your advices. Also I've learnt quite some things about FET transistors during the debugging phase. Only just noticed this John, I was on holiday when you posted so it was hidden by the time I got back! I didn't know the original dropped the voltage to 8V, and yes I think that would make some difference to the amount of dirt out of it. Did you experiment with this and do you think it's worth just adding an 8V zener? you could do it that way, but IMO, it's biggest problem isn't the voltage, it's the fizzy decay that the originals are known for. a stacked NE5534 is the best way to make it sound better. God knows where I'm going to fit that zener in though. BTW, this vero sounds so much like the original that it even has the slightly (and dreaded!) fizzy decay that so many users of BD2's complain about. the solution (and only solution!) to solving that isssue is to use a stacked NE5534 in place of the TL071. I just tried it mine and it sounds awesome. As I see you used a 47n cap in place of the 18n cap in the original one for the tone stack. Did you do this becasue you use it with bass? Any other changes? I'm still looking for a solution to get back some of the highs... Thanks! I figured I would shoot this plea out into the wonderful world of Guitar fx layouts and see if an angel out there could send me a sign or hint at what I am doing wrong. Or maybe even a trouble shooting technique I am not utilizing? The most frustrating part is that I built one and it sounds great, and also that at one point this circuit did work! Well I figure there is not much left for me to do so I may just give up and start over in regards to building the circuit. Onwards and upwards, amigos!! There's definitely a connection problem there, you can hear the noise as the connection makes and breaks. It could be solder, it could be a dodgy pot, it could be rust or oxidation on one of the component leads where it is soldered, it could be a wire somewhere broken in the insulation or it could be a single bad joint. Unfortunately it's one of those things that is impossible to identify from a distance. Can anyone identify the diodes to match up to the original schem? 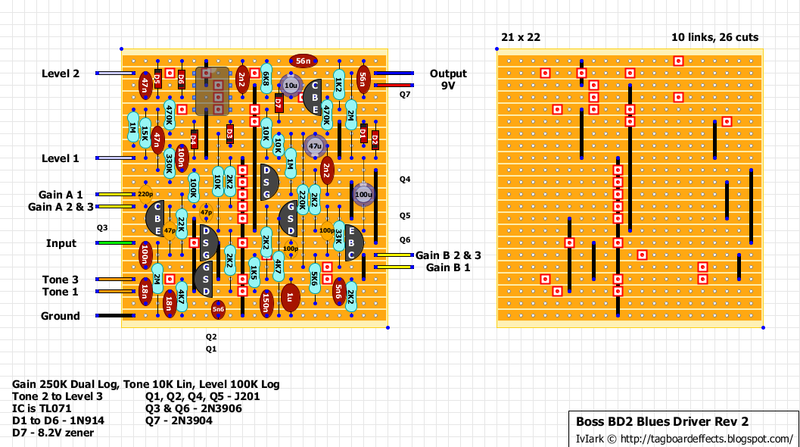 I understand that the labeling on this is different than that of the actual board; I'm really trying to mod this layout to Monte Allum's specs ( I already own an H2O + modded BD-2, just want to play around with it without burning the traces off my own board). This would be very helpful, and I'd appreciate it quite a bit. epic thanks to everyone here - this site rocks! Any thoughts or ideas would be appreciated! Mark, I have a store bought BD2 and I opened it up to see if I could socket the TL071 and try an OPA2134PA. So I open it up, and there is no chip in it! Unless I am crazy.......which is possible....where is this TL071 coming from? Hey bud - it does have an IC, but you will notice that it is a SIP format, not DIP. Which means it's like a long strip, not a little rectangle. It's the long black bit on the left. There should be DIY solutions though, so Google that. Oh, nice links! Thanks Charles! Awesome sound on that one. I love it, thanks a lot for your work. I had to build it twice, I make a mistake on my first try that I was unable to find. So I decided to remake it from scratch. That worth the work. Thanks a lot. I encountered oscillation from having the gain up 1/2+ with the layout as-is. I found running a buffer before the input cleared that up completely. Maybe the input buffer is recommended for this circuit? Just an observation. I have made the entry buffer and no problem at all. I've nearly finished this but have run into a slight problem... I don't know which way the IC goes, can anyone help please? look closely at the diagram. there's a small light gray 1.2 moon at the top of the IC. Ive built two of these and would like to try and decifer the keeley mod. Can anyone help with this? Has there been a layout with the keeley mod added? Ok, so I used an 8.2v zener, put the thing together, got no sound, but a bloody too hot to the touch 8.2v zener. I've checked all the cuts and cleared the tracks with a knife and a run through with the soldering iron. Any ideas where to go with this now? Check the voltages of the IC pins and all the transistor pins and post what you get. In fact check the voltage at both sides of the zener while you're at it just to see what you're getting there. Those voltages will give us a big clue where the problem is.